The weather here is Wisconsin is screaming fall. I actually broke down yesterday and turned on the furnace as is was approaching mid to low 60s - in the house!! Ready or not, here it comes! I did lunch and a movie with a friend yesterday. We saw "The 100 Foot Journey". It is about a restaurant owning Indian family. I have a good friend who is from India whose cooking is divine. I left the theater craving some of my favorites that she prepares. 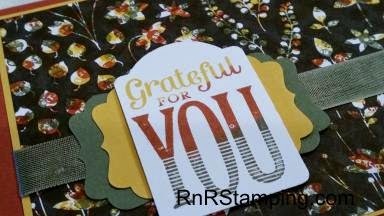 She's coming to my envelope punch board class this Thursday and knowing her kind, generous, caring spirit, she'll bring treats - yum! I'd recommend the movie and dinner afterwards at a local Indian restaurant! Back to stamping. With fall, which is my favorite season, comes the beautiful, rich colors of the harvest, the autumn leaves and this week's PPA challenge. Just realized, curry is a spice used in many Indian dishes - this was destiny! As I looked at this palette, I thought about my DSP stash - hmm, nothing that speaks to this color combo. I wanted something a bit different than just stamping my own DSP. My eyes kept going to the Back to Black DSP, hmmm and BINGO! Using the 'dot' stamp from the Kinda Eclectic set, I stamped a piece of Back to Black DSP with Crushed Curry, Cajun Craze and Always Artichoke. I had to go back with the colors twice because I was seeing too much white for my liking. 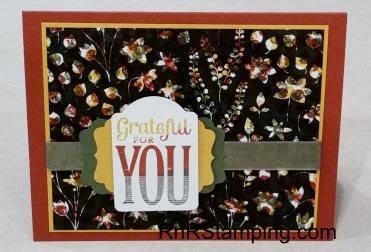 The sentiment is from Merry Everything stamped with a graduated trio of colors Note Tag punch and then cropped with the coordinating punch, then layered on top of the Decorative Label punch and popped up on dimensionals. I used a bit of retired Always Artichoke seam binding ribbon to complete the look. Hope you enjoyed the tip on another way to use your Back to Black DSP. Such a pretty card! Love your dsp!! Susan, so very clever! Thanks for joining us at PPA! A New Twist on Paper Pumpkins! Paper Pumpkin September Sneak Peak - 50% Off!